Salutations, everyone, and rejoice—spring is finally upon us! Unless you live in the Southern Hemisphere, I guess, in which case—prepare for impending winter doom! Or something. Anyways, now for something completely different. This month, before we get to the books, I’d like to talk a little bit about the ancient Greek maxim, “Know thyself,” not just because it’s advice I’ve always tried to live by, but also because it’s a central theme to each of the stories in this review. First, though, we have to determine: What do these two simple words actually mean? While the Greek playwright Aeschylus uses the saying as a caution, warning Prometheus to stay in his place, and Emerson regards it as an injunction to seek the divine within, my favorite attribution comes from Socrates (and The Matrix! ), who admonishes us to understand ourselves, fully and completely, and that in doing so, we can start to understand others. For me, “know thyself” is the journey of self-discovery, of learning how to be honest with yourself. To know thyself is to identify your flaws and reconcile them, identify your virtues and enhance them, and to never stop asking, “Am I the person I wish to be?” Most importantly, if the answer to that question is, “Not yet,” what steps do I undertake to become so? “Know thyself” is understanding that some things are out of your control, and that’s okay. No one ever has total command of their circumstances. “Know thyself” is realizing that sometimes doing the right thing hurts, but that the consequences are worth the result. If it were easy to fix the world, it’d already be done. “Know thyself” is acknowledging that the present is all we can ever live in, no matter how much we’d like to change the past or predict the future. “Know thyself,” reader, and know you are not alone on that road. Now it’s time for me to step off my soapbox, and on to the reviews! 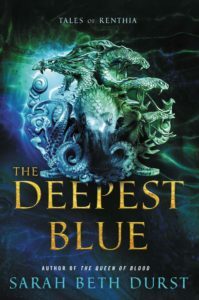 Our first book today is The Deepest Blue, by Sarah Beth Durst, and is set in her Queens of Renthia universe (sidenote—the Queens of Renthia trilogy is excellent and you should read those as well, it starts with The Queen of Blood). In this world, humans co-exist with elemental spirits, but these spirits are less Studio Ghibli whimsies and more ravenous forces of rage that try to murder every human they find, which, as one can imagine, keeps humanity on its toes. The main character, Mayara, lives on an island separate from the mainland where the Queens of Renthia trilogy takes place, but like the protagonist in those books, is one of the rare humans who can control spirits by her will alone. Unfortunately for Mayara, this power is definitely more of a curse than a blessing, since those who show it are seized by the ruling government and thrown onto the Island of Testing, which is basically the Thunderdome cranked to eleven. Mayara, with no previous training in how to control her powers, has to figure out not only how to survive the spirits infesting the Island of Testing, but also how to deal with her marriage being cruelly interrupted and the decay of her country due to ongoing spirit attacks. I really enjoyed this book, not only for the vivid imagery (which, fair warning, involves some pretty gruesome deaths set amidst the picturesque island scenery), but also for the excellent character development that is a hallmark of Durst’s writing. Mayara grows and changes throughout the book as she learns more about herself, and it’s not just her—secondary characters are treated to their own emotional arcs as they push beyond what they thought themselves capable of, and face multiple challenging scenarios. You don’t have to be familiar with the Queens of Renthia trilogy in order to understand what happens in The Deepest Blue, as Durst does an excellent job of explaining vital information without it feeling expository, but there is one secondary character that might seem odd without having knowledge of her backstory, and the world as a whole felt more fleshed out knowing the events that came before. That being said, The Deepest Blue is still an excellent stand-alone story that will have you looking at the ocean in a whole new light, and one I highly recommend. Read if: You like inspirational female protagonists; you thought Island of the Blue Dolphins could do with a lot more violent deaths; you want to unleash the kraken. Our next book, A Boy and His Dog at the End of the World, also starts on an island, but one firmly rooted in reality—a small, wind-blasted spit of land off the coast of Scotland, in a dystopic future where ninety-nine percent of humanity has been wiped out due to a mysterious plague that rendered almost everyone sterile. On this island a small family lives, grappling with their own personal tragedy, and they possess another rarity—a pair of dogs, a species that followed humanity into ruin. For the protagonist, Griz, life is hard, yet still worth living, but that all changes one day when a traveler appears, ostensibly to trade, but in actuality with a far more nefarious purpose—he steals Griz’s dog. Armed with nothing more than a bow, some arrows, and raw determination, Griz begins a journey to track down the stranger and retrieve their missing family member, a trek that takes Griz through the crumbling remnants of the world that was, and into the empty loneliness of the world that is. First off, let me enjoin you, the reader, to avoid absolutely all spoilers about this book. You should read A Boy and His Dog at the End of the World without anyone else telling you anything about it, because Griz’s journey is one best experienced with the same sense of discovery and fascination as the book’s protagonist. Fletcher writes with an elegantly descriptive style, one that brings this melancholic world to bittersweet life, and each location Griz visits is almost immediately visualizable. Whether it’s the rusting remains of an amusement park, or the dusty floors of a tucked away sanctuary, Fletcher makes the reader feel like they’re standing there, right beside Griz, desperate to find out where to go next. Another aspect of the book that I really liked was that in a world shorn of people, the few that Griz does meet are memorable, distinct, and multi-dimensional. There are no throwaway characters or encounters in this story, and Fletcher does an excellent job of bouncing back and forth between moments of tension and those of quiet contemplation. 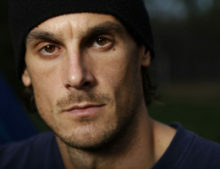 Throughout the trip, Griz faces challenge after challenge, and none felt forced or unbelievable—a frequent stumbling block in dystopian fiction. 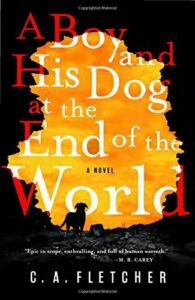 Overall, I felt A Boy and His Dog at the End of the World was well worth the time spent reading it, though I’m glad I don’t live in that world. Read if: You like Iain Banks’ The Wasp Factory; you like your dystopian journey with a smidgen of hope; you like dogs. 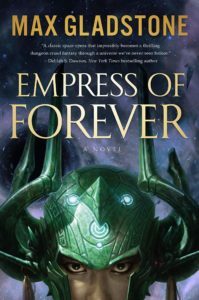 The last book in this review, Empress of Forever, is one I’ve been particularly looking forward to ever since it was announced, as I’m a huge fan of Max Gladstone’s Craft series, and was eager to see what he would bring to a space-opera type setting. I’m happy to say that he did not disappoint. Empress of Forever is about as much of a departure from the intricate, more methodical legal-system-as-magic of the Craft series as you can get, but this isn’t a downside. Instead Gladstone takes us on a high-octane rollercoaster through the width and breadth of a fantastical universe, introducing settings and characters that feel as if Simon R. Green’s pulp Deathstalker novels and Iain Banks’ Culture novels had a glorious, star-smashing baby, one filled with amazing set-pieces that wouldn’t look out of place on a big-screen blockbuster, but also one filled with insights on sacrifice, fate, and friendship. The book starts with the protagonist, Vivian Liao, the richest and most powerful woman on Earth, engaged in a desperate plan to escape the political noose closing in around her neck, one involving faking her own death—and then the real story explodes into gear. A strange woman in green appears, defying all laws of physics, attempts to kill Vivian, who then awakens in the midst of a battle between killer robots and zen-fu monks on a space station orbiting a ring of constructed black holes, and if I haven’t sold you on reading Empress of Forever at this point, then I don’t know what else to do, because I haven’t even gotten to the deadliest pirate queen in the universe, the sentient swarm of nanomachines, or the pilot who was literally born to fly. The book isn’t all action and no thought, however. Gladstone does an amazing job of fleshing out all the characters in his book, Vivian included, and who they are at the end of the book is nowhere close to who they were at the start. In addition, the universe itself is a marvel to behold, full of bold worldbuilding and a sense of scale epic in scope, but not so large as to detract from the complex relationships between Vivian and those she meets. This is the type of book perfect for getting lost in not just once, but multiple times, and I cannot recommend it enough. Read if: You like Thor: Ragnorak and Guardians of the Galaxy; you like introspective treatises on the nature of self; you like awesomeness. Ancestral Night, by Elizabeth Bear; Finder, by Suzanne Palmer; No Country for Old Gnomes, by Delilah S. Dawson and Kevin Hearne; Seven Blades in Black, by Sam Sykes. That’ll do it for this installment, and I’ll see you all next time. Know thyself!